CHAPEL HILL, N.C. -- The last time North Carolina was this good and this fast with a point guard capable of pushing the pace so well, Roy Williams was coaching a guy named Ty Lawson. "We've never played as fast as I want us to play," Williams told me this week. Now it's Coby White, a freshman, who is leading the Tar Heels and has become the star for the 8th-ranked team in the country. In the preseason, Luke Maye was expected to be the MVP for UNC, and Nassir Little, a projected lottery pick, thought to be the standout newcomer. Instead, it's been White who's taken the mantle on both. He's still a work in progress but is nonetheless one of the best freshmen in the sport. "Coby White can push that basketball the way I like it to be pushed, probably better than anybody I've had since Ty," Williams said. And while "fast" is never fast enough for Williams, White has thrived as the lead guard in an offense that's playing more possessions per game (76.5) than any Williams-coached team since the 2001-02 Kansas Jayhawks. White's fearlessness and confidence has played a part in that, in addition to UNC lacking a traditional post man. "Last year we couldn't score around the rim, couldn't defend around the rim," Williams said. "We didn't change our personnel that much, so we're still having problems in those areas. So for us to score, we need to score against a team before they get set. We have a much better chance of scoring in the open court because we don't have the Tyler Hansbrough, the Sean May, the Tyler Zeller, the Kennedy Meeks that we can throw the ball into on the low block and good things are going to happen." UNC fell at home Monday to No. 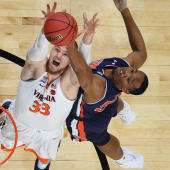 4 Virginia, but had White's desperation 3-point attempt to make the game 62-59 counted, Cavs coach Tony Bennett told me it might well have changed the outcome. It was the turning point in what was a terrific game for about 39 minutes. White is a 6-foot-5 scoring point guard who is flourishing, which isn't an automatic for freshmen under Williams. (Little being a current example.) He's also doing things that have never been done before by any freshman in program history. Against Miami on Saturday, White had 33 points and six assists, matching his season high; he had 33 vs. Texas earlier in the season. He's now the only Carolina frosh ever to score at least 33 points twice in a season. Not Jordan. Not Carter. Not Hansbrough. Not Jamison, Worthy, Montross, Ford, Perkins, Cunningham, Barnes, Stackhouse or anyone else. What's more, White's the first UNC player to have at least 33 and 6 in a game since Joe Forte in 2000. He's averaging 16.0 points, 4.2 assists, 3.2 rebounds and is making 38 percent of his 3s. "Felt like I was back in high school," White told me of the Miami outburst. White scored 3,573 points at Greenfield High, a North Carolina high school state record. He was a scorer by necessity then, significantly outclassing his teammates. His seamless adjustment to college has come with more of a point guard mindset, yet he's still got score-first ambition, which is encouraged by Williams. "He's a competitive little rascal," Williams said. White was an early commitment for Carolina, doing so long before his senior season began. Williams started recruiting White when he was a sophomore. On his visit, they spent three hours in Williams' office, the conversation going long. It wasn't a typical visit. White soon knew UNC was going to be his pick. "I fell in love with the program, the system, just playing pickup with the guys," White said. "Coach told me he was going to be the hardest coach ever when he was coaching me. Took those words to heart and he's been everything he said he was. He's continuing to make me into a great player." White wants Williams to let him loose -- but keep him in check. For the most part, it's working. White is as responsible for UNC's 19-5 record as anyone, and he's done this while starting alongside three seniors. The combination has largely worked. UNC started 9-1 in ACC play for the first time ever under Williams. Williams told me he prefers scoring point guards in his offense. He added that, defensively, White is progressing more quickly than he can remember any other freshman at UNC. That's a bit tantalizing. It's also a major reason why UNC still needs to be considered a national title contender. Injury updates: UNC's Final Four hopes will also rest with how healthy the team can be. In the Virginia loss, Little left the game with an ankle injury; Cam Johnson briefly went down, too. Updates on those players are expected later this week. Meantime, Williams told me that Leaky Black's dealing with a high ankle sprain, so he's not expected back in the immediate future, while Sterling Manley is still not practicing at full-court speed and won't return to action until he's able to do so for about a week. We might have a situation where UNC isn't at full strength again until March. In 2017, CBS Sports told the story of Towson coach Pat Skerry, whose son, Owen, is autistic. Skerry and South Florida assistant Tom Herrion, whose son, Robert, also lives with autism, have been champions of raising awareness for autism while using college basketball as a conduit to help bring about a cure. This weekend, more than 400 schools/coaches will be wearing blue puzzle-piece pins and using their games as platforms to educate the public on what autism means, how people can thrive in spite of the diagnosis and what more can be done to accelerate a way to a cure. Skerry and Herrion started this six years ago. It's grown into a real movement, becoming bigger each year. "It's all about awareness, although personally it's cool to see so many great coaches sporting the pin," Skerry said. "Owen is my guy. He is almost 10, making progress, but this is a daily battle." Skerry has coached at Towson since 2011 and won 123 games, including constructing one of the most impressive turnarounds this century. In his first season, Towson won one game. The Lions won 43 the next two years. He's as proud of this autism awareness weekend as anything he's done in coaching. "Being a parent is a daily worrisome job," Skerry said. "It's amplified when you have a child on the spectrum. You hope through awareness people will be more understanding and accepting as time goes on." I encourage you to read this story to get a glimpse inside the life and home of a coach, and a family, living with this battle. Hopefully, coaches are prompted to speak up about it Friday, Saturday and Sunday. On Saturday, the NCAA released its annual one-time-only mid-season reveal of the top 16 teams in college basketball. Four days removed from that mini bracket and obviously plenty has changed. What we didn't see was a reveal on all the teams, but it's worth noting at this point that there are 13 conferences that have at least two teams in the top 65 of the NET rankings. While it's key to keep in mind that the NET rankings will not dictate who does and doesn't get in, it will be the primary sorting tool. It also stands to reason that in year No. 1 of the NET, we could see some interesting seeding and selection decisions that might not match with how teams slated in the RPI were treated in the past. But at this point if you're 65th or higher in the NET, you're considered a quality team in that metric -- easily Quad 1 in a road environment. So it's a bit encouraging that so many leagues have multiple teams that, while all don't have a real shot at an at-large, if you're top-65 and are in a mid-major league, your auto-bid situation could do damage to the bubble for big teams. Here are the leagues with multiple teams in the top 65. Notice how the Mountain West oddly only has two teams in the top 65 of the NET? Nevada might have picked the best and the worst year to have its greatest team in school history. The league, which turns 20 this year, has never been worse in men's basketball. At KenPom.com, the MW ranks 13th among all conferences -- trailing the MAC, SoCon and Ivy League. The MW has never been close to this mediocre. It's been sixth, seventh, eighth or ninth in every year with the exception of 2014 and 2015, when it was 10th. Nevada is lording over this league and the only real challenge remaining, seemingly, is at Utah State on March 2. The Wolf Pack are 0-0 vs. Quad 1 opponents. As we saw on Saturday, the committee is holding that against the Pack. Utah State will offer their only such chance in Quad 1. This is ultimately why, even if Nevada wins out and is 34-1 on Selection Sunday, a No. 1 seed will be unlikely. Here's a probably unanswerable question: when's the last time, if ever, a team has lost two conference games in the same season at the buzzer on freakish half-court shots? Illinois State could be the only team that applies. Redbirds coach Dan Muller was befuddled by Sunday's ridiculous ending at Missouri State. If you didn't see it yet, do check this out. Craziest ending of the season in college hoops. And on Jan. 2, Valpo beat Illinois State like this after trailing by 10 points with 2:20 remaining. Yeesh! Had those shots not fallen, as is usual, ISU would be 16-9 with a 9-3 mark in the Missouri Valley -- keeping even with league-leading Loyola-Chicago. Instead, the Ramblers hold a two-game lead on ISU, Drake and Missouri State. Davis has 108 3s in 24 games. The single-season freshman record is held by none other than Davidson's Stephen Curry, who made 122 in 2006-07. Davis is going to beat Curry's record if he keeps up with his average of 4.5 3s per game, likely doing it at home vs. IUPUI on Feb. 28. It's a shame Detroit is just 9-16 this season; Davis has been an interesting story and should be a top-30 player in the sport next season. Gonzaga coach Mark Few told me Tuesday that Killian Tillie's torn plantar fascia is an unknown at this point in terms of whether or not he'll be able to play in the NCAA Tournament. There's a hope, but Few said, "Totally dependent on how treatment does, trying everything. We have a lot of time." Plus, the NCAAs start almost a week later than normal this year. More troubling injury issues for a conference leader: Kansas State sophomore guard Cartier Diarra is out indefinitely while requiring surgery on his injured hand. Diarra is such an important piece to K-State's defense that his absence could be what helps Kansas eventually climb even in the Big 12 standings and keeps KU's streak going. Virginia coach Tony Bennett told me on Monday night that point guard Ty Jerome is still dealing with back issues and tightness but will continue to play. There's obvious lingering concern given the nature of back injuries; Virginia needs Jerome in order to remain in contention for a No. 1 seed. Here's something absurd: Arizona State hasn't made back-to-back NCAAs since 1980-81. The Sun Devils, who squeaked into the field in 2018, are an 11 seed in Jerry Palm's latest bracket. They need to win at Colorado on Wednesday and at Utah this weekend to remain at-large worthy. Bet you didn't know: there is an undefeated team left in college basketball. Division II Northwest Missouri State is 23-0 and only has games remaining vs. sub-.500 teams. Might college hoops have an undefeated national champ? Congratulations to Tulane for its forthcoming unveiling of maybe the best uniforms in college basketball this season. 🧐 at our 🆕 #MardiGras uniforms we unveiled yesterday! Watch us wear them in action! Arizona State's Remy Martin gets all face on Washington State's Marvin Cannon on Feb. 7. You can see the sweat slapped off his face. Pic via Joe Camporeale of USA Today.